An irresistible invitation - I thought. That one small crack…that patch of light…that hint of morning blue. 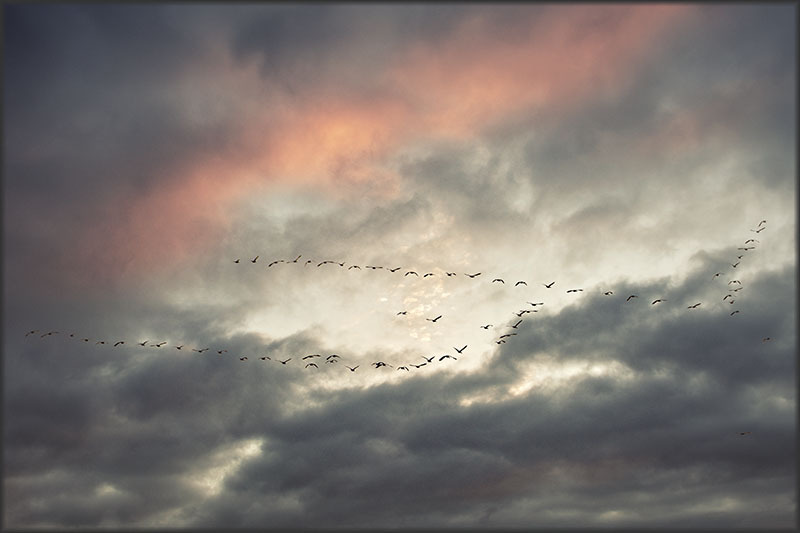 Looked up - just in time to capture the south-bound geese. The shortest day...the longest night. I remind myself to breathe...to feel...to see this dark while looking towards the changing light. It's that time when we begin to think about new intentions. How do I wish to 'be' in this coming year? How might I 'show up'? For myself? For others? What might a newer...different...better 'me' look like? Looking back at this year that's been. Finding that ground before opening myself up to all that possibility. So many changes. So much growth. A new home. A new community. A new life. A co-founder of a new non-profit. From here - the days will be getting longer...the nights shorter. The geese - will fly south...and return north again. Slowly - the earth will continue to turn. The darkness will return to light. And - the answers to my questions - will come. I looked up just in time to see what it is that they might see. A spot of sunshine...in a field of grey. A piece of newly painted yellow...on a canvas that has history. No one is going to rain on their parade.